Over the last eight years, Jillian and I have had many long nights with our three children. There have been nights where the kids have caught a virus or an illness and we are up all night with either child. These nights have come and go as most parents can attest, but there have been some nights that have truly tested our faith. One particular night is when Oliver was in the hospital when he was six weeks old and had a procedure to secure nutrition. He had to have a specialized intravenous preparation to give him the essential nutrients for his body to heal. The procedure that her had to undergo would place an intravenous line directly into his heart and then he would be able to get the medication. While in the procedure room with him the medical staff informed me that the next hours will be critical because of the risk of his body not maintaining the proper temperature and the risk for infection. After the procedure was completed, we returned to our room. In the middle of the night we were woken with alarms in the room that he had dropped in temperature. The drop was so significant the team had to use extraordinary measures to stabilize his body temperature and vital signs. This was the longest night that I can remember. In this chapter of Daniel, Daniel is presented with a long night as well. To the causal onlooker, life and death are weighed in the balance, but for Daniel this was another opportunity to show God’s love and grace. In the previous chapters, God has revealed many times before that the circumstances that we are present with are chances for God to do some amazing work: for both you and the other person. At this point in the journey Daniel is approximately 80 years old. He has seen the height of the Jewish authority; been exiled into a new land; made high officer in three different kingdoms; interrupted and conveyed the hardest information to ruthless kings. Through all of these years and experiences Daniel has seen the glory of God and how these situations worked out for God’s Glory. King Nebuchadnezzar to all peoples, nations, and languages, that dwell in all the earth: Peace be multiplied to you! 2 It has seemed good to me to show the signs and wonders that the Most High God has done for me. At the beginning of the chapter, Daniel is reappointed to the highest position in the kingdom and is not admired by many except the new king Darius. Darius makes proclamations about praying to other entities and deities, except for him. 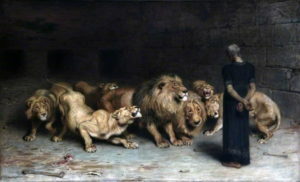 This proclamation backfires on the relationship that Darius has with Daniel and Daniel is sentenced to the lions’ den. This is a punishment that others have seen as ultimate condemnation for the acts against the king. But this a final testament of the faith of Daniel, he was blessed by God to survive the punishment. As we go through our journeys we will face many difficult and dark times. Some we are able to navigate easily and others may be challenging, but we must always remember that when we have a relationship and have an unwavering faith in God, we will come out in the morning with renewed sense of self and bountiful blessings.